21 January 2019 marked the centenary of the first Dáil Éireann, but 1919 is also the starting point for the DIFP series as a whole. One of the government departments established by the first Dáil was its Ministry of Foreign Affairs, headed by Count George Plunkett (the father of the executed 1916 leader Joseph Mary Plunkett). Within weeks, the Dáil made good on one of Sinn Féin's electoral promises by sending a delegation to the postwar peace conference in Paris. The Irish diplomatic service can thus trace its origins back to the first Dáil, and 2019 marks its centenary as well. Here is a short round-up of a couple of things of relevence to that. 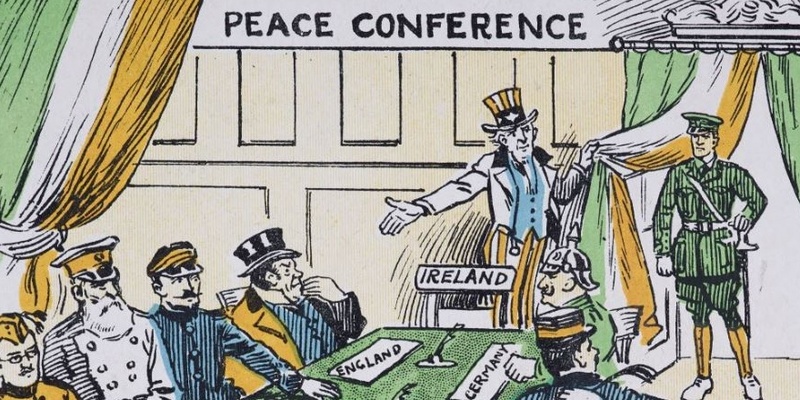 The most recent of The Irish Times' 'Century' supplements appeared on Monday, and some of those involved in DIFP were contributors, in the form of John Gibney's piece on the activities of the Irish delegation in Paris, and Bernadette Whelan's article on Woodrow Wilson and the 'Irish question'. Our most recent blog on Michael MacWhite, one of the members of the Irish delegation in Paris, may also be of interest. A longer version of that piece can be read in the current (Jan.-Feb. 2019) issue of History Ireland, while Century Ireland have published an essay by John Gibney on the Dáil Éireann diplomatic service during the revolution. We have also curated a mini-exhibition of original documents relating to the Dáil's diplomatic service in Paris, Britain and Germany, which is on dispaly in the lobby of the National Archives of Ireland, Bishops St, until the end of January; it will then be on display outside the main reading room until the end of March. And finally, we should end where we began: with the first volume of the DIFP series, covering the critical years 1919-22. It is still in stock and, to mark the centenary of the first Dáil, is currently on sale at half-price; a bargain at €20! Image courtesy of the National Library of Ireland.